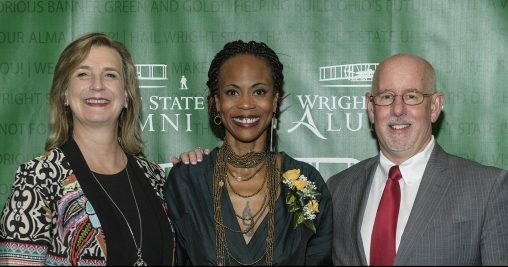 Hannah Beachler, a 2005 Wright State University graduate who was raised in Centerville, took home her first Academy Award Sunday night. Those who know her in Dayton were delighted, but not surprised. “She has her eyes on the prize, and she won,” said W. Stuart McDowell, professor and artistic director at Wright State’s Department of Theatre, Dance and Motion Pictures. Beachler, the first African-American to win an Oscar for Best Production Design, created the world of Wakanda for Marvel’s film “Black Panther.” She shared the award with Jay Hart. The movie was also awarded an Oscar for Best Costume Design and Best Original Score. “Black Panther was a transcendent movie, way above the norm of the style of the Marvel comic book movies, which is why it was the biggest and best seller last year,” McDowell said. Beachler’s motion picture work may take her around real and imaginary worlds, but she continues to return to the Miami Valley for film screenings and to share advice with students. Last year, she founded the Carol Trevino Film Production Fund in memory of a close friend and classmate who died in an auto accident while working on a film in Louisiana in 2007. The scholarship aids Dayton-area students interested in film careers. Jonathan McNeal, manager of the Neon Movies in downtown Dayton, recalled during award nominations earlier in the year, people would say they were not surprised she was nominated and would be surprised if she didn’t win. “There’s such excitement for her work, not only the connection that ‘Black Panther’ made with audiences but also for breaking a lot of ground,” McNeal said.